Check the connector down in the footwell. Not sure if it's located in driver or passenger side, offside or nearside, but in my LHD, its down in the left footwell, which mean driver side to me. Mine has a lot of corrotion, and are due to a complete rebuild of some sort. replacing the contacts, or just solder every connector instead, I'm not sure. It our only driver at the moment, so I'm not going to touch it. I was way overdue with MOT this year, should have been in in May, but I choose ignore the date, and do some driving during the summer. We automaticly get a 2 months extension on the MO, so everything was fine when I got back from The Danish LRC gathering by the end of July. Everything except my chassis, and some inner wings.. The chassis was fixed before MOT, but I left the innerwings stuff for later. The guys at the workshop was not pleased with my inner wings, but failed the MOT because of some other issues. Rusty body mount in the left side front, and they "claimed" that the brake pipes was not properly fixed on the right hand innerwing. So back again, I started to strip the front wings, and was planing on doing a lot of welding on the old inner wings. After some more use of wire brush, and thinking , I decided to order som new panels from http://froggatts.co.uk Today 25 Kg of steel arrived at my office. Good delivery from Froggatts and TNT. I think I'll take a few days of now. That seemed to do the trick. Shorting out those 2 pairs of pins on the 16 pin connector to the instrument panel worked (I was told). My co-driver has just rebuilt his 6x6, and replaced the old V8 with a TD5. 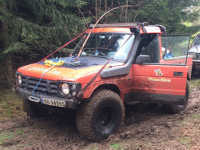 (yes it' sbeen argued that he should have kept the V8, but he wanted a TD5...) The engine, wireloom and the ECU comes of a MY2003 Defender, which also had ABS/TC. As said, this was a MY86 V8, with drum break in the rear, and a reinforced front axle. And there would have been som complications replacing the second axle with a newer one. And there would of course have been some issues getting ABS working on 3 axles. The engine swap has gone well, it drives and brakes nicely. But there is an issue with the ABS warning light in the dash. We've tried to disconnect the WABCO-unit, which I believe is the ABS control unit, and that did not work. Also the brake warning light is on all the time, although there should not be any issue with the braking (except the missing ABS sensors, and input to the WABCO-unit). Does anyone have a suggestion ? What steering wheel is that. Looks nice. This was our camping setup when we visited @tuko in september on his Småland Traxx. Me an my wife in the roof toop tent (on the trailer) and my friends in the other tent. A quickup tent for the dinning area. Nice Trip, cant say the same about the weather. I was looking at Bolt-on-bits grille myself, since the grille on our D2 is kind of broken at some places, but yes, the price is silly. 9399£ ? Was that the actual price, or is there something wrong with the price on ebay ? I bought headlamps and trim surrounds for my 200tdiD1, and was not impressed with the fit. I've later bought a pair of jeep headlight mountings like these . Much better fitment. Norsk Land Rover Klubb national rally 2018 is in Laerdal, not that far from Geiranger. Picture from testing one of the greenlanes. The whole family on our way back from a scout camp in 2012. Me and my wife in the roof tent, Oldest son in the hammock outside, and the 2 youngest kids inside the car The closest "neighbor" had a RV-home with boggie, and a tv the size of my windscreen. Yes, number 13. When I changed the gearbox in my D2 (auto -> R380), I had an annoying sound that went away when I had a hand on the gearstick. It also helped to tightened that bolt. Check that the bolt locking the upper part of the gear stick is tightened.